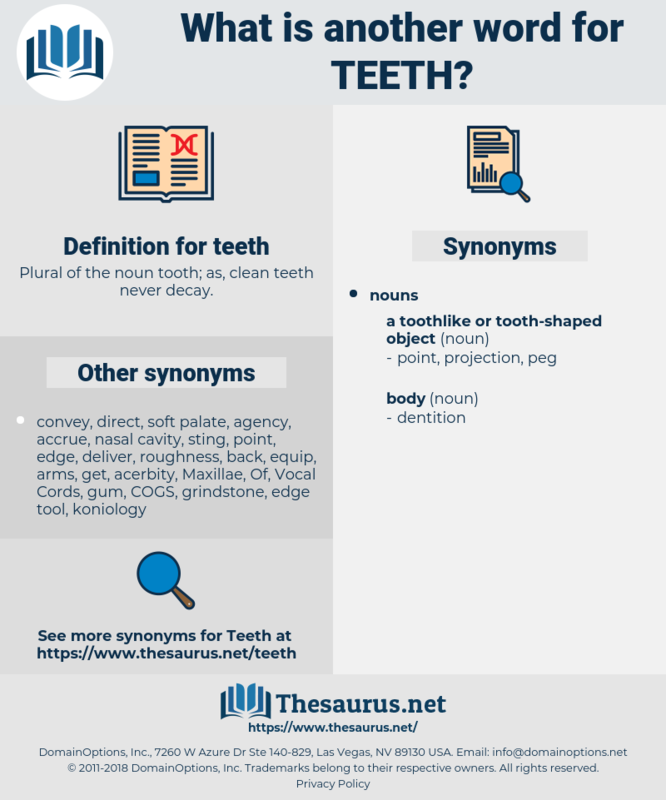 What is another word for teeth? 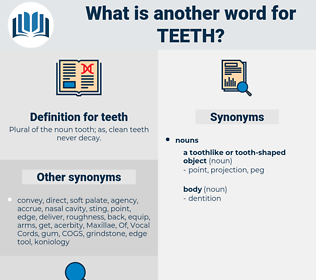 Plural of the noun tooth; as, clean teeth never decay. toxicology, 'dental, NIHB, human, mama. Mouths, TOES, threads, strengths, clutches, jaws, Feet, teethers, breathes, effectiveness, efficient, sights, Dentures, EARS, legs, weight, Weights, weighing, CLAWS, Lips, Dentists, wheels, Efforts, Yourself, breathe, Whites, efficiencies, appliances, regrets, ambitions, words, shapes, Sympathies, teens, corridors, ways, crocs, poids, Capabilities, authority, smiles, taking, condolences, halls, strong, Traps, looks, ft, tines, means, napkins, dents, wise, Diseases, merits, Capacities, avenues, munchies, force, forces, Faces, blond, smart, powers, pleas, take, peaks. top, edge, water, day, mouth. I have white teeth, and fairly even. This did me good: for it woke the fighting - man in me, and I set my teeth. mouth, Rima Oris, oral cavity, oral fissure.